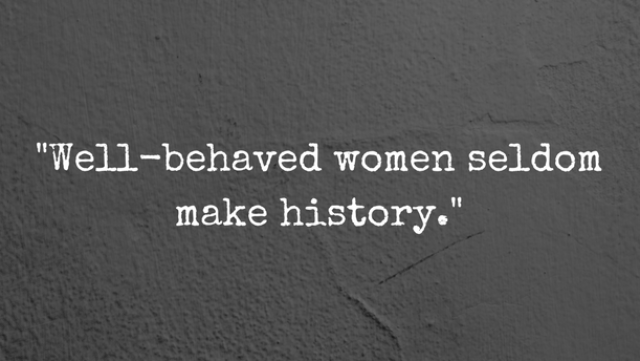 “Well-behaved women seldom make history” is an often-quoted phrase written in an article by historian Laurel Thatcher Ulrich in the 1970s. It appears emblazoned on all kinds of things, particularly T-shirts and bumper stickers, urging women to be less well-behaved and more interested in making change in their moment in time. I find myself thinking about this quote more often lately than I ever have before, usually after reading the news or yet another study about women and the workplace. Ulrich's phrase came to me again recently as I read about a study from the Human Resource Management Journal that demonstrates that if a woman is to be understood as confident and/or influential at work, then she also must be liked. Emily Peck of The Huffington Post notes, “For men, being liked—defined in the study as exhibiting pro-social traits, like kindness and helpfulness—did not matter.” Men have “to do well” at their jobs to appear confident. Women have to be competent, influential, confident and liked. Of course, the standard is higher for women. Of course, there's a double bind for women at work. Women have to fit both stereotypically feminine and masculine traits at work to make progress. Veering too far in either direction has consequences. Being disliked comes with penalties. Women must both work harder and be kinder than men to get ahead in their careers. Now, this is likely not surprising to any woman who has navigated the workplace. Cultural expectations of how women should act often conflict with the preferred traits at work, which still remain coded as masculine. Behaving well appears to be the only way to get ahead, but is it worth it? What if we gave up on it anyway? What if, instead, we chose to be unruly? Anne Helen Petersen's Too Fat, Too Slutty, Too Loud: The Rise and Reign of the Unruly Woman (2017) takes a serious look at celebrity women who appear as “too much” and the reactions of their variety of audiences: academics, journalists, fans, haters, etc. These are women who emerge as unruly while they negotiate the boundaries of what acceptable or unacceptable womanhood is. Petersen, a Ph.D. in media studies and senior culture writer at BuzzFeed News, is interested in “women who, in some way, step outside the boundaries of good womanhood, who end up being labeled too fat, too loud, too slutty, too whatever characteristic women are supposed to keep under control.” So, she analyzes the reactions to Serena Williams, Melissa McCarthy, Madonna, Abbi Jacobsen, Ilana Glazer, Nicki Minaj, Kim Kardashian, Hillary Clinton, Caitlyn Jenner and Lena Dunham. Petersen demonstrates how each appear unruly and shows that some of these women also appear more problematic in the unruliness. The intersections of their identities matter in how the press and the public react to them. Petersen points out that there's acceptable and unacceptable unruliness, which often centers on “the color of a woman's skin, whom she prefers to sleep with, and her proximity to traditional femininity.” It becomes clear that it is easier to be unruly if you are white, straight, thin, young and American. For everyone else, to be unruly is risky. Unruliness puts us at risk because it pits women against dominant norms and expectations of femininity. The closer you are to those norms, the more likely your unruliness appears more palatable and inoffensive. Unruliness also puts us at risk because it forces us to confront the patriarchy that defines our lives and that many men and women would rather defend than question. Unruliness pushes against the narrow vision of acceptable femininity and suggests that there are other ways to be a woman in our world, beyond what our culture tells us we should be. Unruliness can be the path to liberation, to being who you are, to claiming the space to exist on your own terms. Unruliness illuminates the lies conformity tells us and the consequences of becoming a person on another's terms. To be unruly is risky because you are shaking the foundations. You are questioning patriarchy. You are demanding something more than you've been given. You are challenging the structures of the world. Unruliness is risk and liberation, but it's worth it. To be unruly is a risk Petersen wants us to take. Her book makes the case for unruliness while showing what women are up against “increased legislation of women's bodies, the persistence of the income gap, the policing of how women's bodies should look and act in public, and the election of Trump.” Her book makes clear that what Americans say we believe is quite different from how we act every day. We might believe in gender equality, but we don't act like we do. I agree with Petersen that being unruly feels more necessary now than ever before. We have to tread carefully because unruliness can sometimes reinforce the very norms we seek to challenge, but it can also break down the expectations that stifle us. Readers, be unruly women. Be women who are “too much.” Be women who refuse to meet the cultural expectations of what a woman should be by showing all the possibilities of what women are. Be women who challenge the status quo of our world and shake its foundations. Take that risk. Be unruly.